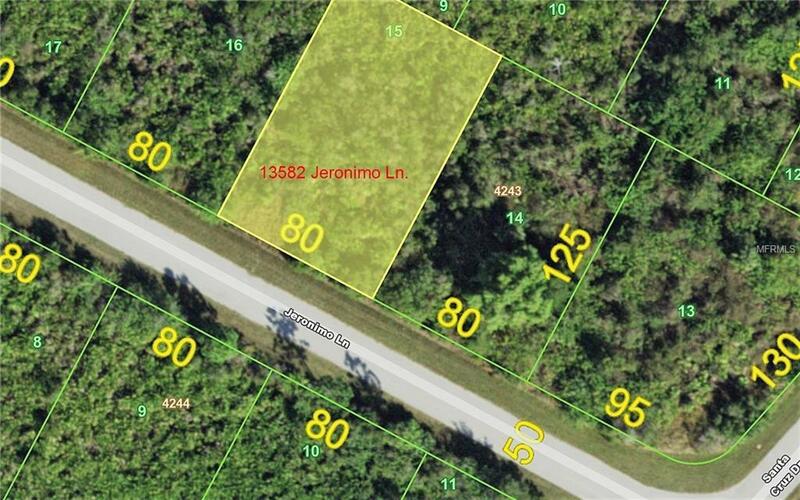 Purchase this lot and the one next to it (13590 Jeronimo Ln, Listing # D6104557) to have more space for building your new dream home. The lot is not in a scrub jay zone (Federally protected bird). The lot is in the South Gulf Cove Community. Homeowners Association is VOLUNTARY, NOT MANDATORY. HOA VOLUNTARY FEES are shown under Community Information. Public boat ramp is only a short drive away. The community does have a yacht club if you wish to join. Beautiful beaches on Boca Grande or Barrier Islands are within minutes away. Englewood Beach is approximately 25 minutes. Golfing, groceries, restaurants are all within minutes. Tampa Bay Rays Spring Training is approximately 19 minutes. Port Charlotte Town Center Mall approximately 20 minutes. Seller has more lots than these, contact your real estate agent for a list. If you do not have a builder already, we will be glad to help you find one. Amenities Additional Fees South Gulf Cove Yacht Club.